The tradition of Christmas was introduced in India by the Portuguese, the Dutch, the French and the British who began to colonise India in the 15th century. The Anglo-Indian community continues to preserve the European customs and festivals all over India. They have maintained the old traditions and celebrate Christmas with zeal and piety. On this special occasion, they bake rich fruity cakes, decorate their houses with streamers, bells, stars and glittering Christmas trees and wear new dresses to attend Midnight Mass, on Christmas Eve. Everyone relishes the Christmas feast of various delicacies, mostly consisting of duck or chicken curries. Kulkuls are also cooked, as it symbolises Christmas in India. Presents are exchanged and “Merry Christmas” is wished. Every year, on Christmas day, Indians visit their local churches to pray. On this holy night, churches in all over India are decorated with Poinsettia flowers and candles. Because India is a multicultural nation, many different languages are spoken here. In Hindi and Urdu, Happy/Merry Christmas is “Bade Din ki Mubarak”; in Sanskrit it is “Krismasasya shubhkaamnaa”; in Bengali “Barodiner shubhechha janai”; and in Tamil it’s “Christhu Jayanthi Nalvaalthukal”. Nativity plays are staged in Christian schools and churches on Christmas morning. The children recreate and depict the birth of Jesus Christ and then a person dressed as Santa distributes candies to the children. Santa Claus is known as “Christmas Baba” in Hindi and “Christmas Thaathaa” in Tamil. Hymns and carols resound in the beautifully decorated churches that glitter in the night. In the malls, departmental stores and Christmas funfairs, joyous Santas shake hands with the children who come to buy gifts and toys. Carolling processions on streets and thoroughfares can also be seen on the 24th night. Every Christian home creates a nativity scene, often displaying a manger in the front window. Giant star-shaped paper lanterns are hung outside the house. Sweets, mainly home-made like the Kulkuls, are served in every household to welcome visitors and well-wishers. In the Southern states of India, Christians often light small clay oil lamps and decorate the flat roofs of their homes, to show that Jesus is the light of the world. In the North-western states of India, the tribal Christians of the Bhil folk take out carolling processions during the whole Christmas week and often visit neighbouring villages to tell the Christmas story to people through songs. Church of the Immaculate Conception, Panjim, Goa. 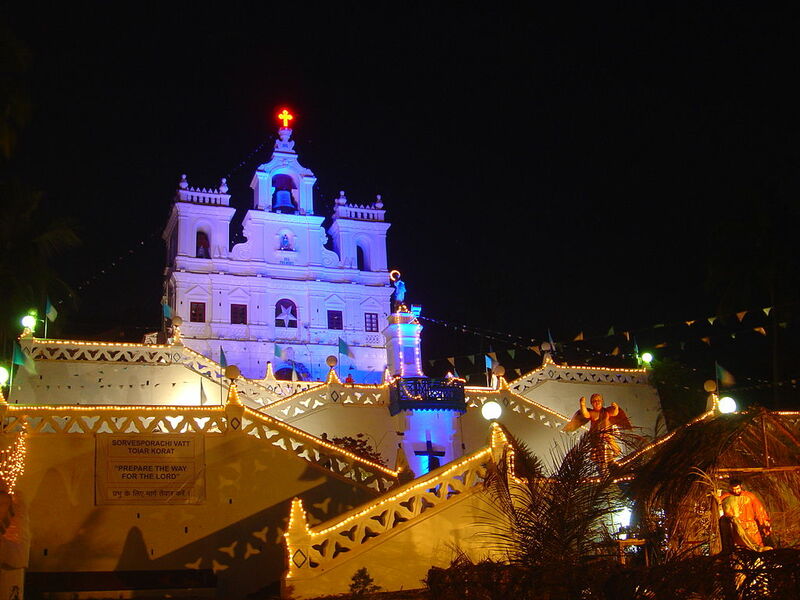 In Goa it’s a feast for the eyes, as the Goans celebrate Christmas in every nook and corner. Churches are decorated, as are roadside chapels with streamers of light and candles; a legacy of more than 350 years of Portuguese rule. The Portuguese explorer, Vasco de Gama was one of the first Europeans to reach Goa in 1489. Ever since that time, India has had a strong Portuguese influence, especially religiously. Some notable churches in Goa include the Basilica de Bom Jesus, Church of Our Lady of the Rosary, Church of St. Anne, etc. The Goans make merry on the beaches and celebrate at home along with all the family members. India may be a Hindu country but Christmas is an important national festival which is not only celebrated by Indian Christians but also by the Indians of other castes and creeds. 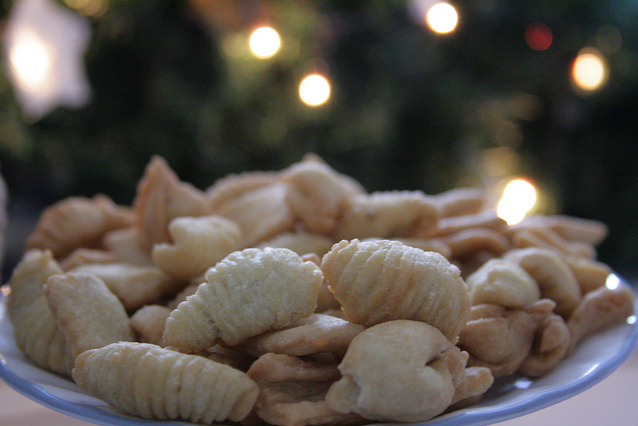 Kulkuls are traditional sweet meat prepared by Indian Christians during Christmas time. They are easy to make and can be stored in an airtight container. Add the butter gradually and mix again. Beat the eggs in a separate bowl and add them to the flour-butter mix. Add the powdered sugar and coconut milk to this mixture and knead into a soft dough. Form the dough into small marble-sized balls. Grease the back of a fork with some oil and flatten and press a ball of dough onto it. Starting at one end, roll the dough off the fork and into a tight curl. The end result will be a tube-like curl with the design from the fork on it. Make similar tube-like curls with the remaining dough. Heat the oil in a deep, heavy-bottomed pan on a medium flame. Turn regularly till they are a light golden brown. Drain and keep aside on a kitchen paper. In a separate pan prepare the sugar syrup by adding granulated sugar and water and cook till the sugar melts fully. Put the cooled kulkuls into this sugar syrup and coat well. Remove and allow to cool in a plate till the sugar encrusts on the kulkuls. Serve them to commemorate Christmas. See also “Kolkata, the City of Joy, celebrates Christmas”.